Cerys Edwards, a student at Canolfan Gerdd William Mathias (Ruthin branch), has been awarded this year’s scholarship from CGWM in memory of Ben Muskett. Cerys, who’s 16 years old, studies the piano with Teleri-Siân. Cerys said, “It was a surprise to hear that I had won the Ben Muskett Scholarship. I had just performed in a concert by some of CGWM’s students and was called back to the stage to be presented with the trophy and the scholarship money.” Congratulating Cerys, Meinir Llwyd, Director of Canolfan Gerdd William Mathias explained “Ben Muskett was an inspiring piano tutor at CGWM when he tragically died in a car accident in 2011 aged only 25. This scholarship is awarded annually to pianists under 18 years old who receive lessons at CGWM. This is our way of honouring Ben’s passion for music and teaching children and young people” Cerys said, “Being awarded the scholarship means a great deal to me. 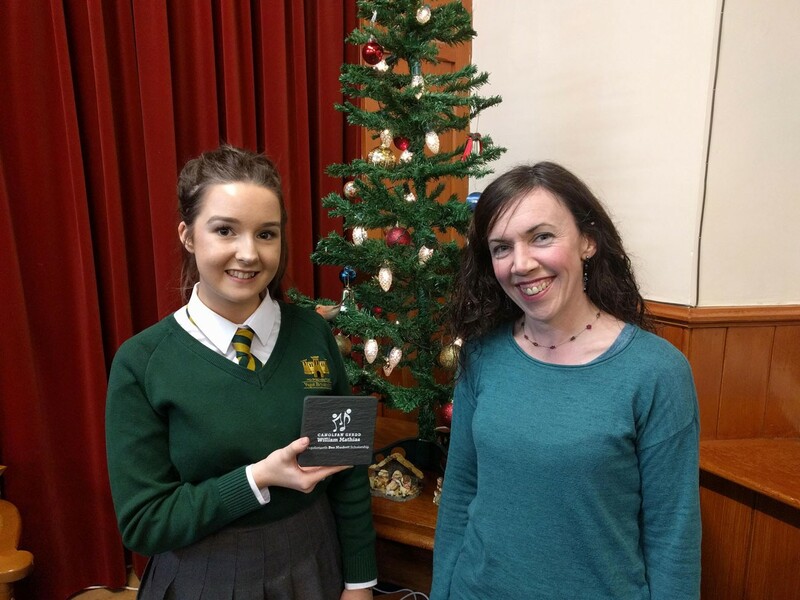 The money will help me to buy new piano pieces that I wish to learn – including Chopin Waltzes, and Debussy Preludes as well as some jazz pieces too.” Cerys studies music at Ysgol Brynhyfryd with Miss Llinos Williams. 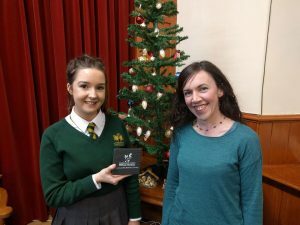 She started piano lessons when she was six years old with Mavis Johns, before starting lessons with Teleri-Siân in 2012. According to Cerys, “I really enjoy coming for lessons with Teleri-Siân at CGWM and with her help, I succeeded in passing my Grade 8 piano with merit during the Summer.” Llinos, Cerys’ mother said: “We have been very fortunate to receive piano tutors of the highest standard over the years – my son Sion, as well as Cerys’ sister, Cathrin, have enjoyed coming for piano lessons with Teleri-Siân.” In Year 9, Cerys won the third prize in the Years 7-9 Piano Solo Competition in the Urdd National Eisteddfod in Bridgend. She is also a faithful member of Côr Cytgan Clwyd. Canolfan Gerdd William Mathias (Music Centre) was established in Caernarfon in 1999 and since 2012, the music centre has also been providing music lessons on Monday evenings at Theatr Twm o’r Nant, Denbigh, and since 2017, at Capel Tabernacl, Ruthin on Wednesday evenings. The scholarship trophy was presented to Cerys during a ‘Llwyfan Cerdd’ student concert at Pwllglas Village Hall. The concert included performances by students of all ages who receive lessons at the music centre, as well as the music centre’s junior and senior harp ensembles, Telynau Clwyd under the direction of Morwen Blythin and Dylan Cernyw.